Readers discuss the nuanced discrimination that often plays out in taxis, as well as ride-share services like Uber and Lyft. The discussion was sparked by our piece from Doug Glanville about the discrimination he faced at LAX, a piece that eventually persuaded the city council to ban taxi discrimination at that airport. I’m white. Some years ago, after dinner in Midtown, a black acquaintance with a train to catch at Penn Station asked me to hail him a cab, explaining that taxis won’t stop for him because they don’t want to go all the way up to Harlem or out to Brooklyn or the Bronx. They want to go where they have a good chance of picking up another fare in short order. They don’t want to drive empty back to Midtown. It was an economic decision based on experience-informed probabilities. I also have come to understand that drivers have major concerns about safety or about the economics of getting return rides after dropping someone off. But this is where bias is circular—you have to make a lot of assumptions to draw these sorts of conclusions without engaging with the passenger on any level. But I knew what was going on: The driver had concluded I was a threat, either because I was dangerous myself or because I would direct him to a bad neighborhood (or give him a low tip). He’s hand-waving these motivations away, basically indicating that they hold no weight and no justification. And it’s certainly true that no justification would make racism good, that nothing would make these events fair to a black person simply trying to get a ride home. But in coming to the conclusion that these taxi drivers simply “learned” their racism on arriving here and assuming they pull their biases out of thin air, Glanville has avoided the hard, real conversation for the easy, comfortable and ultimately useless one. About money: Taxi drivers don’t make a lot of it. What hard data there is shows that black people tip less in almost all situations, even when adjusting for income. See this 2006 study from the Cornell University School of Hotel Administration. The same paper notes that in what taxi-specific data there is, black people tip less and are four times more likely not to tip at all. Taking fares from black people means, for taxi drivers, significantly less money. There’s no statistically plausible way it couldn’t. 1. African-American cab drivers, on average, were tipped approximately one-third less than white cab drivers. 2. African-American and Hispanic passengers tipped approximately one-half the amount white passengers tipped. African-American passengers also seemed to participate in the racial discrimination against African-American drivers. While African-American passengers generally tipped less, on average they also tipped black drivers approximately one-third less than they tipped white drivers. Passenger discrimination against African-American drivers was not subtle: African-American drivers were 80 percent more likely to be stiffed than white drivers (28.3 percent vs. 15.7 percent). About danger: Did you know taxi driving is the occupation with the highest on-the-job murder rates in the U.S.? It’s over twice as bad as the next closest job: being a cop. 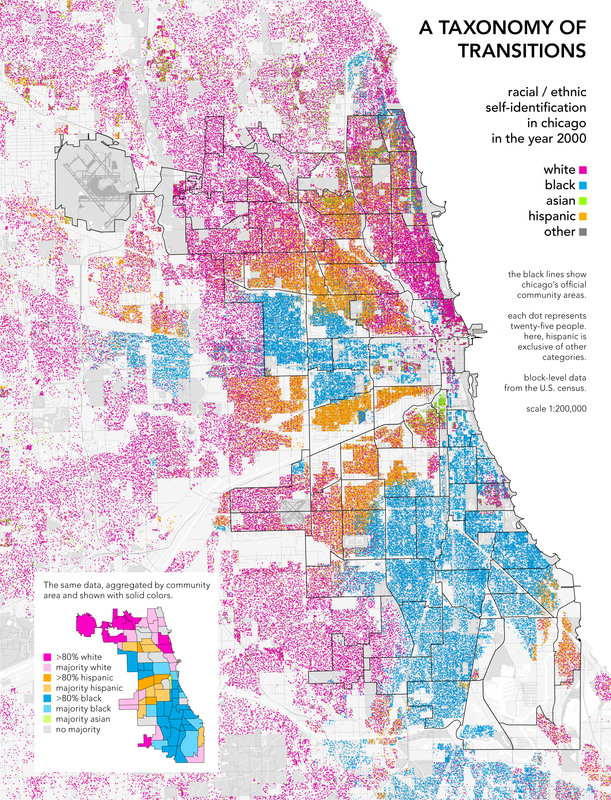 This is a map of the racial breakdown of Chicago. This is a map of crime density in Chicago. They are nearly identical. The black areas are the high-crime areas, more or less, and also the low-income areas. Taking more fares from black passengers means going to more dangerous places. There’s no statistically plausible way it couldn’t. It also very likely means less return fares, which means less money for increased danger. We can and must talk about how there’s a lot of history behind why those maps look like that. We can and must talk about policies that feed that problem and prolong it. We have to talk about why a lot of black men and women are denied jobs and opportunity. We even have to go all the way down the line and talk about people who are racist but don’t have a lot of control or money—taxi drivers, for instance. What we can’t do, though, is ignore what having that conversation means. The studies that exist suggest that to a taxi driver, that tip money and those return trips mean the difference between not making the rent and making a just-barely-living wage. The murder statistics suggest that a taxi driver is more than anyone else in America justified in worrying about driving into high-crime areas. Does every black person live in a dangerous neighborhood and refuse to tip? No. But statistically, the likelihood is increased. Glanville calls these men racist, and he’s right. Nothing can justify that and make racism positive. But every relevant piece of data we have shows that that racism might mean the difference between barely scraping by and getting evicted, of being able to do a dangerous job in slightly less dangerous places or not. There’s a difference between a rich man in a safe place being racist and what Glanville is talking about. It’s worth noting that in my experience, the drivers who most blatantly refused me service have never been white. According to a 2004 The New York Times report, 84 percent of New York City cab drivers are immigrants (the vast majority are “of color”), just like my father was in the mid-1950s. English was not the first language of the driver who refused me at LAX. This fact complicated the story for me. On the one hand, it was sobering to see how newcomers to the United States could not only adopt longstanding racial and institutional biases, but entrench them even further. On the other hand, I knew that I was in a position of power, and that I was in danger of making assumptions myself. This notion that the rest of the world is a racism-free oasis, and that people come to this country and pick up racism, like some virus, is so much nonsense. Try getting a cab in Asia, the Middle East, and large swaths of Europe. For that matter, try talking to a black African about African Americans. I agree, especially because the author mentions that the cab driver was Asian. I’ve been to China—everyone’s racist there, even against their own kind (China is BIG, with a lot of different ethnicities), and especially against black people, whom they openly detest. For example, this Beijing shop had a sign out front saying This shop does not receive, Japanese, Philippines, Vietnamese, and dogs. And it’s not unique; I’ve seen several similar examples. The cab driver didn’t pick up this attitude in the U.S.; he brought it with him. Problem: It’s hard for black men to get a taxi. Leftist solution: Sue the taxi company, thereby raising rates for everyone. Talk incessantly about institutional racism. Hijack college curriculums so every student at America’s universities gets indoctrinated. Start protest movements that fail to improve the lot of black people in America but succeed at vilifying police, resulting in a violent crime spike throughout America. Cobble together a trillion dollar set of government programs that don't fix anything, but do create a permanent underclass of dependent recipients. Talk and talk and talk some more about the problem with anyone who will listen, and get angry at white people who don't have time to listen to you because they, you know, have a job and a family. Play this game for decades, creating permanent division between the races in America, then stand outside in New York and get angry that even after all that, a black man still can’t get a cab. Capitalist solution: Invent Uber. Problem solved. As a Black man living in Brooklyn for 20+ years who has traveled throughout the U.S. and to Europe, Asia and Africa, I read Glanville’s piece with some interest and some first-hand experience with the issues at hand. His was a nuanced piece and I congratulate him on that. However, I agree with most of the criticisms made regarding the assumption that immigrants “learn” racism once they arrive. I think they DO learn the racial pecking order (long ago, Richard Pryor had a very bitter comedy routine regarding Vietnamese immigrants learning to properly say the word “n******r”) and I think they do employ the same heuristics regarding crime, race, gender and geography that many Americans do. All very nuanced and very difficult to grapple with. I greatly appreciate the absence of a comments section. But I recognize that it puts an editorial burden on you to read through, select, and publish certain opinions. Unless your goal was to provoke a less-than-thoughtful debate, I think you failed on this one. These are difficult issues, but they are manageable ones if we can avoid the partisan nonsense that works in electoral campaigns. On your blog, you have the opportunity and the responsibility to influence how these issues are dealt with. As an aside, in NYC, you don’t “sue the taxi company” as a general response. You take the driver to TLC Court. I’ve done it, twice. The specific driver faces fines (and potentially lost work time). To initiate the process you note license number (on the plate, on top of the cab and on your receipt) and dial 311. That contested reader response was worth airing because, if nothing else, it prompted that far better followup email with those informative links.